"Experience the fashion show of the Antwerp Fashion Academy from the front row. Show/Off is a unique magazine about the Fashion Department, Royal Academy of Fine Arts - Artesis Hogeschool Antwerp. It features exclusive photoshoots of the student collections, unique portraits of the graduates, sketches and drawings by the students, and so much more. 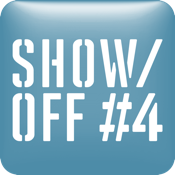 Show/Off is a collector's item made with the same creativity that is so all-important for the Academy and the fashion world. And for the very first time, Show/Off is now also available on iPad. Redesigned especially for iPad with extra's including exclusive footage and photographs from the annual fashion show on June 16 - 18, 2011. The magazine is published for Projecta vzw and the Antwerp Fashion Academy by Sanoma Magazines Belgium. "